GUMNUTS.....AND OTHER STUFF: Mount Tomah with a Kiwi. Mount Tomah with a Kiwi. 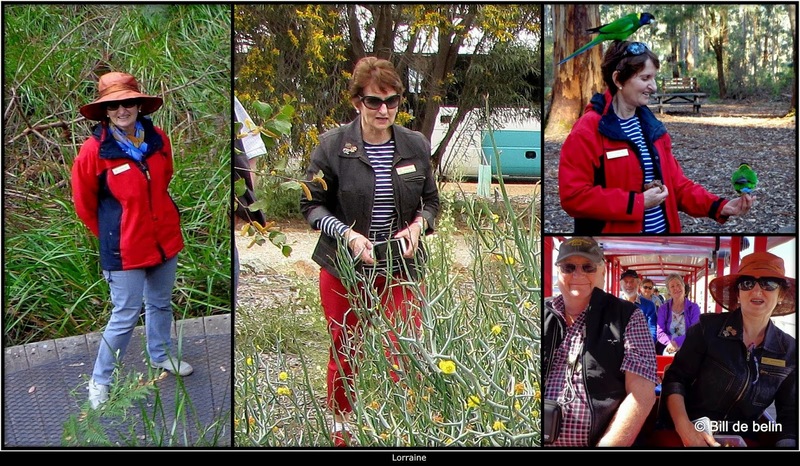 The Kiwi is Lorraine, from Tauranga New Zealand, who we first met on the WA Wildflower trip we did in September 2014. We were to go to and meet Marlene and Neil, also from the WA trip, for the weekend in Queanbeyan but that visit had to be postponed due to the passing away of Neil's father. Being the last week-end that Lorraine was to be in Sydney we decided to still have a day out and would go up to Mount Tomah and Mount Wilson to visit the gardens of the area, unfortunately the weather wasn't the greatest with misty rain and showers. We were able to get around most of Mt Tomah without getting too wet but Mt Wilson was a bit wetter, so we stayed in the car except for a quick visit to a chestnut farm and then checked out the plant nursery at 'Merry Garth'. Lorraine's knowledge and appreciation of the plants made it a very well worth trip.We had lunch at the Monkey Creek Cafe, thanks Lorraine for that. Flowers to keep out the rain. Lorraine's umbrella was very appropriate or the occasion. It was hard to catch their smiling faces. Eucalypts, twice as nice in the rain. Still looking for the name. This was at 'Merry Garth' Mount Wilson. Visiting the New Parents at Umina. Ridin' Along on my Pushbike ..... (P)honey.